The New York Times plans to adopt Apple's In App Subscription model for its iPhone and iPad applications by late June, with prices starting at $15 for every four weeks worth of access to its published content, the publication said Thursday. The announcement marks just the second high-profile media outlet to agree to Apple's In App Subscription model for digital publications announced last month. This arrangement, which sees Apple keep 30% of revenues generated from each digital subscription, was unveiled alongside The Daily, a digital newspaper created specifically for the iPad by media heavyweight News Corp. that sells for $0.99 per week. Although the Times is launching digital subscriptions in the Canadian market beginning today, it is doing so in order to fine-tune the customer experience prior to the global launch of the service on both non-Apple devices and iPad and iPhone on March 28th. The iPhone and iPad applications will gain a 1-click purchase option on June 30th. For non-home delivery subscribers, the Times said the basic package, which includes NYTimes.com access plus a smartphone (or iPhone) app, will start at $15 every four weeks (or $195 per year). A second package offering NYTimes.com access plus a tablet (or iPad) app will fetch $20, while an "All Digital Access" package offering full access to NYTimes.com and both of the aforementioned applications will sell for $35 every four weeks. "Our decision to begin charging for digital access will result in another source of revenue, strengthening our ability to continue to invest in the journalism and digital innovation on which our readers have come to depend," said New York Times publisher Arthur Sulzberger, Jr. "This move will enhance The Times's position as a source of trustworthy news, information and high-quality opinion for many years to come." In moving to its paid subscription model, the newspaper said it will continue to allow non-subscribers of NYTimes.com to access up to 20 articles per month at no charge before they will be asked to become digital subscribers in order to be granted open access to the site. 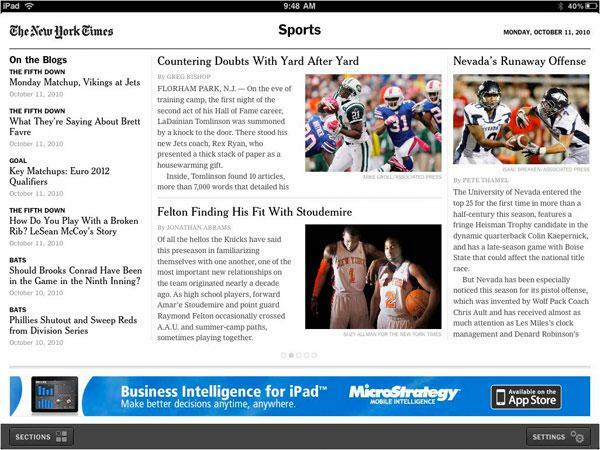 Additionally, the Top News section of the Times' smartphone and tablet applications will remain free to all readers. Home-delivery subscribers who pay to have the Times delivered to their doorstep will receive free, unlimited access to the paper's content on NYTimes.com, tablets and smart phones. And those readers who come to Times articles through links from search, blogs and social media will continue to be able to access those individual articles, even if they have reached their reading limit. Additionally, the homepage at NYTimes.com and all section fronts will remain free to browse for all users at all times.